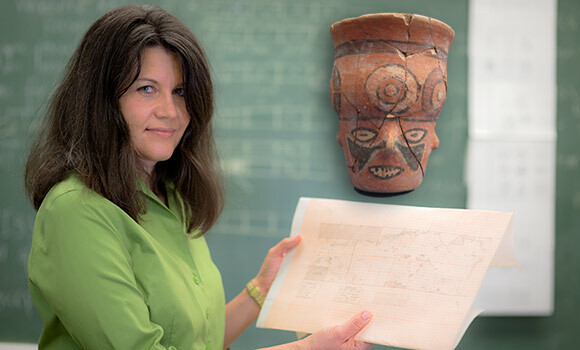 UNCG Professor Donna Nash, along with archaeologists from other universities, have spent 20 years excavating a site of the Wari Empire in Peru. Inset image is an example of a vessel from the brewery on site. Over beer with colleagues one night in 1997, UNCG Archaeology Professor Donna Nash agreed to take part in an excavation to explore the ancient Peruvian Wari Empire. At the time she had no idea how important the simple activity of communing over beer was to bonding people and celebrating alliances in antiquity. Nearly 20 years later, Nash and the team of archaeologists from five other universities have proof that communing over beverages was as essential to the fabric of the Wari society 1,000 years ago as it is to society today. The Wari civilization, the earliest Peruvian empire, existed from 600 to 1,000 A.D., prior to the better-known Inca Empire (1350 to 1532 A.D.). The Wari Empire once controlled 800 miles of the rugged Andean sierra. In the seventh century they expanded far to the south and established a colony with several settlements 350 miles from the capital city. On this tenuous frontier the Wari built a spectacular citadel on a towering mesa called Cerro Baul in southern Peru. At the sacred location the archaeologists discovered the ruins of a massive brewery. Sidebar: Want to know how Wari Beer tastes? Excavation at the Wari brewery uncovered vast remnants of corn mash and molle berries, the primary ingredients of the beer. After a lot of experimentation Nash and the team believes they’ve found the recipe for the beer produced more than 1,000 years ago. The Field Museum of Chicago has partnered with craft-brewery to create a version of this ancient recipe. Made using ingredients indigenous to Perú, the beer, WARI Chicha de Molle, is a light and delicate, pink-colored beer. Because of the time and effort required to make the fragrant combination of molle (moi-yey) berries – red peppercorns – and purple corn, the team surmises that the beer was an essential part of rituals to celebrate peace treaties and major political decisions. The other element that supports this deduction is that in the high, arid environment, the beer would only last for five days. Apparently beer was serious business for the Wari. Evidence Nash and the other archaeologists have found in a nearby cemetery leads them to believe sharing beer and communing with neighbors was essential to peace and prosperity. For three centuries the Wari Empire bordered, and actually overlapped with the Tiwanaku, a powerful state with its capital on the shores of Lake Titicaca (now Bolivia). Despite the possibility of territorial conflict, excavations have found that none of the 4,000 people buried in the cemetery suffered violent deaths. Regardless of the encroachment into the Tiwanaku, it seems that the empires honored treaties and lived together peacefully, a somewhat surprising fact during a time of imperial expansion. The beer may have contributed to this. In addition to the archaeological research Nash and the team have done, the site has served many of her students through experiential learning. Since 2011 Nash has sponsored a total of 66 UNCG undergrads, grads and alumni who have supported the team’s work. Other researchers on the team that has lead excavation of the site include Dr. Michael Moseley and Dr. Susan de France, both from the University of Florida, and Dr. Ryan Williams and Dr. Sofia Chacaltana, both from the Chicago Field Museum.